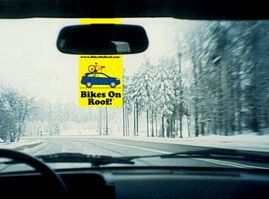 A line-of-sight reminder to spare your bike, roof rack, and garage. If you carry a bike, board, or boat on top of your car, you know the risk is real. This roof rack reminder works because it’s a habit to check the rear-view mirror. Can you put a price on peace of mind? Clearly, this is a wise investment in your gear.